For over 80 years, Epiphone archtops have been the first-call for musicians looking for timeless sound and classic style in one guitar. During swing's golden age in the 1930s, New York City was the music capitol of the world and it was also the capitol of the archtop guitar world, too. Artisan luthiers and old world craftsmen were plentiful and many instruments from that era are now serious collector's items, including classic Epiphone designs like the Emperor Regent, De Luxe, and Olympia. But while most New York City’s archtop builders retired from the business or ran for cover when rock and roll hit, Epiphone never stopped refining the classic designs that made Epi Stathopoulo the king of archtop manufacturers. Epi was determined to make distinguished and great sounding archtops with quality materials that were affordable to working musicians. He insisted that a great guitar belonged on stage, not on a wall in a glass case. So, Epi’s Epiphone showroom on West 14th Street in Lower Manhattan put the leading guitarists of the day like Les Paul and George Van Eps in the shop window to show the world that an Epiphone was an affordable work of art. Epiphone's timeless Emperor Regent still sets the standard for jumbo jazz boxes and is still one of the largest, measuring 17" across the lower bout for unmatched full-range, big jazz tone. Like its famous sister the Epiphone Broadway, the Emperor Regent is a direct descendent from Epiphone’s early archtop days and the "war" between then-fierce-rival Gibson and the Stathopoulo brothers. The Epiphone Broadway is backed by our famous Epiphone Lifetime Limited Warranty featuring Gibson 24/7/360 Customer Service and guarantees the instrument against defects in materials or workmanship. 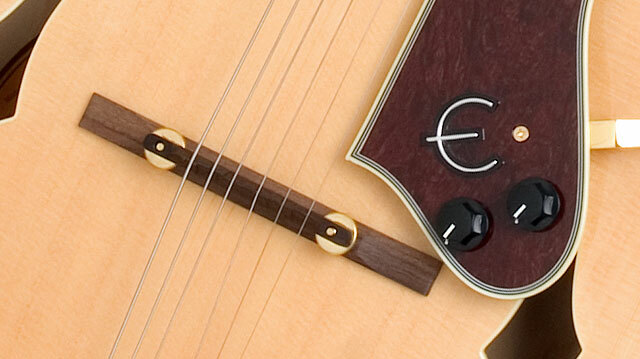 Try one at your favorite Authorized Epiphone Dealer soon. The 25.5” scale neck with a 1.68” nut is made from Hard maple and features a rosewood fingerboard with Epiphone's signature "block and triangle" pearloid and Abalone inlays. An adjustable, floating rosewood bridge combined with Epiphone's authentic gold Frequensator split-trapeze tailpiece provide a classic look, feel and sound. This big band monster is voiced by an Epiphone mini floating humbucker attached to a classic tortoise shell style pickguard. Controls for volume and tone are mounted on the pickguard. The floating pickup allows the Emperor Regent’s Spruce to breath as one piece for great projection and classic warm tone. 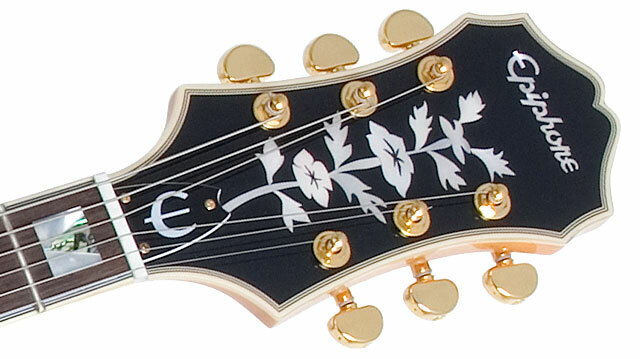 With gold hardware and a multi-bound headstock featuring Epiphone's gorgeous "Tree of Life" headstock inlay, the Broadway is sure to catch many of audience member eye. 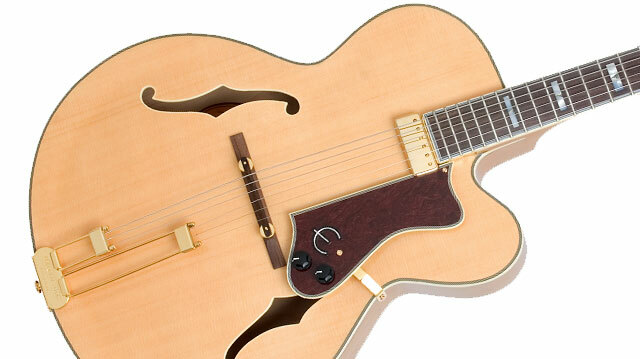 And nothing says “I’m a guitar player” like a beautifully made archtop guitar. To ensure great tuning stability and accuracy, the Emperor Regent includes premium gold 16:1 ratio Grover® machine heads.